The famous Swiss watchmaker IWC Schaffhausen announced the release of new items Portuguese Tourbillon, decorated in a classic style. 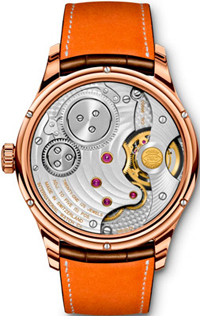 The watch has a round polished body with a diameter of 13 mm and a thickness of 11 mm in 18-carat rose gold (Ref. IW546301) or 18-karat white gold (Ref. IW546302). Water Resistant – 30 meters. Silver or black dial with a radiant finish, equipped with a rolled gold Arabic numerals and hour markers, two central arrows, additional window with a seconds hand at 6 marks, and “floating” minute tourbillon at 9 mark is protected with sapphire crystal with double anti-reflective coating. 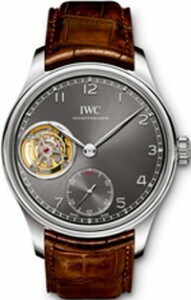 Transparent back cover, made of sapphire glass, allows the monitoring of the work of the manufacturing machinery with manual winding IWC 98900, at 21 stone, with a carrying frequency of 28,800 vibrations per hour, power reserve 54 hours, display functions, hours, minutes, seconds, “floating” minute tourbillon. Tourbillon consists of 64 components. Caliber perfectly trimmed and decorated, and adjusted in five positions. The watch comes on a leather strap, dark brown or black with a buckle in 18-carat pink or white gold.